NIA-CHARLESTOWN NEVIS (January 24, 2011) — Residents of Nevis from all walks of life, are being urged to take part in the 2011 Population and Housing Census when it commences later in the year from April to May. The data collection is conducted in St. Kitts and Nevis every 10 years. 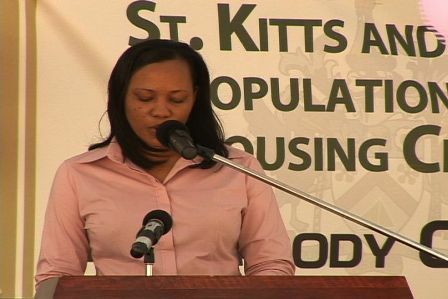 The call came from Director of Statistics and Economic Planning, Nevis Mrs. Eren Hanley on January 20th at the launch of the event at the Memorial Square in Charlestown. The designated slogan for the census is “Everyone Counts”. She underscored the importance of a census and noted that the exercise gave not only an account of persons who lived on the island or the number of living quarters but it also provided invaluable information on where persons lived and characteristics of the population. “These statistics…provide invaluable information to public and private institutions that need these statistics to develop sound policies and programmes for the socio economic development of the country. Increasingly, Population and Housing census statistics are also required by regional and international organisations that give grants or loans for development projects. Investors also look at these statistics, to determine if Nevis is an option for them. “As a matter of fact, we have more requests for statistics from the Population and Housing data set than any other data set at the Department of Statistics. Therefore, it is very important that the Population and Housing exercise not be taken lightly. Everybody needs to be counted to ensure that at the end of the exercise, the data accurately reflects the characteristics of our population and by extension, the needs of our people,” she said. Meantime, Director of Statistics and Economic Planning on St. Kitts Ms. Beverly Harris who was also on hand for the launch, looked at some definitions of the census and its purpose. She said the exercise was the primary source of information which provided the number and characteristics of persons living in each location. It was a form of stock taking that was not only the country’s human capital but the building stock. “It is a numerical count and it is an entire process that involves the collection of the data, the compilation, evaluation, analysis and dissemination of economic, social and demographic data. “One of the primary purposes of a population census is to provide a comprehensive set of statistical information that could be used to engender evidence decision making. A census is normally looked at as a starting point, a bench mark for future studies. The information collected is useful as a framework for the design of samples for inter censual household surveys. In essence, the census data provides valuable baseline data for policy making and planning and for monitoring and evaluating programmes.” she said. According to Ms. Harris, censuses were nothing new and they had been conducted by governments of every era as they saw the need to collect information on their most valuable assets – their people and gave a brief historical detail. She pointed to the Babylonians and Chinese who held censuses mainly for military purposes while the Egyptians collected information on the population so that they could plan armies of people to build the pyramids and redistribute land following the annual flooding of the Nile River. The Greeks and Romans held censuses of population many years before the birth of Christ, Ms. Harris noted. She said it was the five yearly census ordered by Caesar August which required every man in the Roman Empire to return to his place of origin which ensured that Joseph and Mary travelled to Bethlehem for the birth of Jesus. “In the case of St. Kitts and Nevis, our earliest records indicate that we have data as far back as 1871. A census was conducted every year from that period up to 1921. However, no censuses were conducted in 1931, 1941 and 1951. Rather a census was conducted in 1946.The decennial census resumed in 1960. “In most countries a population and housing census is undertaken at regular intervals. In the majority of cases it is every 10 years. In this way comparable information is made available in a fixed sequence. Our last census was carried out in 2001 when a total of 46,325 persons were counted. 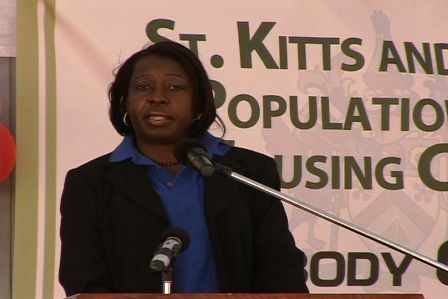 Of this 35, 217 resided on St. Kitts while 11, 108 persons resided on Nevis,” she said. In terms of the historical data for Nevis, the trend in terms of the numbers counted from 1871 saw the numbers range from a high of 13, 087 in 1891 to the very next count which was held in 1990 of 8,794 persons. However, Ms. Harris contended that the census data of any country was of greater value nationally and regionally if it could be compared with results of censuses in other countries taken at the same time. Notwithstanding, she explained that international definitions and classifications used within the census solely provided the comparability of developmental indicators among countries, many of which are used to measure the progress in the Millennium Development Goals and monitoring general demographic indicators.